Captain America met the female he knows only as SHIELD Agent Thirteen back in Tales of Suspense #75-76, and then in ToS#85 and #93-94. Part of the reason he fell in love with her is that she reminded him of a woman he loved fighting with the French Resistance in WWII. Later he will learn that Agent Thirteen is Sharon Carter and his WWII love was Peggy Carter. They are related, originally sisters but latterly retconned as aunt and niece. Hercules and Scarlet Witch aren't formerly a couple. They have been 'heard' having thoughts about each other, but that seems to be par for the course for nearly everybody in the Avengers. It makes sense that Goliath moved his lab to Avengers Mansion after Diablo and Dragon man trashed his home lab in #41. But #58 will reveal there's more to the story. The first version of Ultron hypnotised Hank to quit his old lab and forget Ultron was there. Then Ultron rebuilt the lab and used it to upgrade himself. Human Top was Giant-Man and Wasp's most persistent foe in their own series in Tales to Astonish. 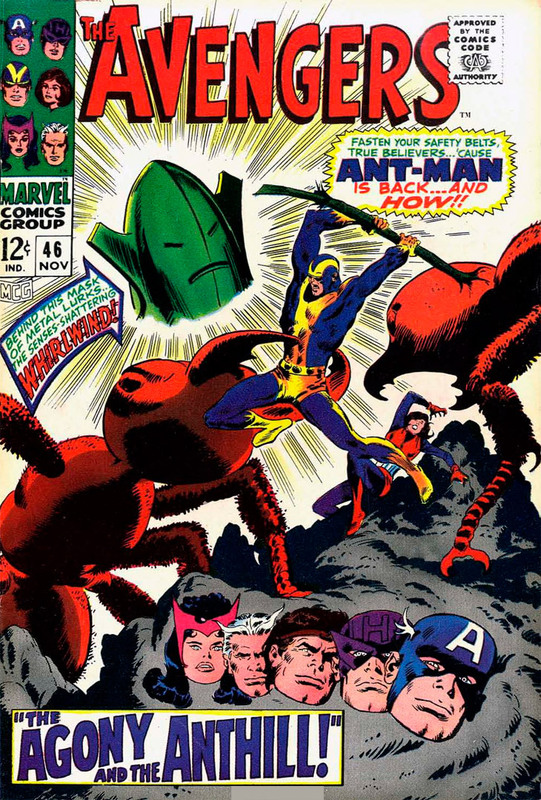 Starting with #50-51, immediately after the issue in which Ant-Man became Giant-Man, he also featured in #55, #59 and the last appearance of the duo in TtA in #68-69. Whirlwind will become a member of the Masters of Evil in #54 and Batroc's Brigade in Captain America #130. Hank and Jan won't realise he was their chauffeur Charles until #139, after they have fired him behind the scenes following events in Marvel Feature #6 and #9. Meanwhile he continues to lurk as Jan's chauffeur next issue. Captain America, Goliath, Hercules, Quicksilver and Scarlet Witch are relaxing in Avengers Mansion, although Cap is still brooding about giving up his costumed identity (which he will do briefly in Tales of Suspense #95-96), and about his new love for SHIELD Agent Thirteen. Hawkeye arrives with the fully recovered Natasha, who is still determined not to return to activity as Black Widow (she was hospitalised in #44, and decided to hang up her costume last issue). Then newly-rich Wasp enters with her new chauffeur Charles. As well as already being out as the Wasp, Jan is blase about using Hank and Pietro's names in front of the civilian. Jan joins him in her Wasp costume because they may want to shrink. Jan has dismissed Charles for the day. But when he gets home we discover that he is really Dave Cannon, Giant-Man and Wasp's old foe Human Top with a new costume and a new name Whirlwind. He's out of jail (after a typically short Marvel sentence) and out for revenge. After becoming Jan's chauffeur to spy on Avengers' security, he decides their security devices are too good for him to fool, and just smashes his way in through a wall or two. Making a lucky guess Whirlwind activates a reducing ray which shrinks Goliath and Wasp to ant-size, and he drops them in Hank's experimental ant farm. Because they were shrunk by ray rather than by mental command they can't grow of their own accord, they haven't retained the strength of full-sized humans, and Wasp doesn't have her wings. 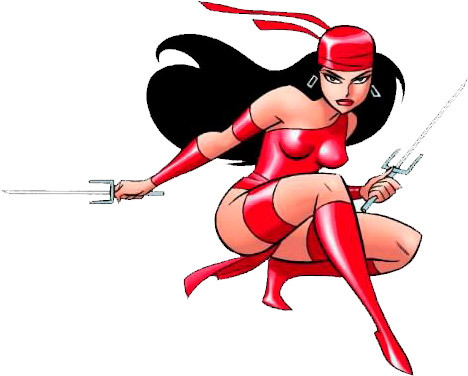 By ill luck Wasp is wearing her old costume, and has left her stings in the new costume she had last issue. On top of that they're in a colony of red ants, and they've only worked with black ants before. Which may be irrelevant because their modern costumes don't include ant-controlling cybernetic helmets. To add urgency to their plight they see Whirlwind though the glass side of the ant farm planting a time bomb. Armed only with a stiff piece of wire the partners fight their way towards a cybernetic control centre Hank built in to the farm. On the way Wasp kills a larger ant who is the queen, and the other ants stop fighting. Hank fashions a cybernetic helmet from bits of the control centre, and the duo ride ants to the top of the ant hill, and Hank clambers out of the ant farm. Whirlwind makes good his escape. Cap uses the reverse setting on the reducing ray to bring Hank and Jan to full size. But Wasp feels it has had some effect on her powers (I don't think anything ever comes of this). And Hank plans to include a cybernetic helmet in his costume from now on, and function as Ant-Man as well as Goliath. Plus: Goliath (Hank Pym), Whirlwind.